You are invited to join SWEP for the screening of Big Dream at the Boulder Public Library on Saturday, October 3rd. We will be getting for refreshments together afterwards at the Southern Sun (~6 PM). Please RSVP through the link below (not affiliated with SWEP), and send an email to mountainswep@gmail.com if you plan on attending. 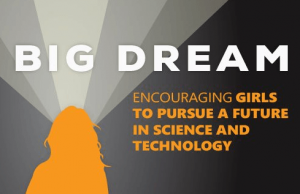 Big Dream follows seven young women living in different parts of the world who are breaking barriers and overcoming personal challenges to follow their passion in science, math, computing and engineering. From small town Iowa to the bustling streets of the Middle East, Big Dream immerses viewers in a world designed by and for the inspiring next generation of girls. Following the film screening, there will be a short panel discussion with local girls and women in STEM fields. Click here to RSVP. The Society of Women Environmental Professionals (SWEP) is a national non-profit professional association of women involved or interested in environmental law, science, education, business, and policy. Our Rocky Mountain Chapter serves as a resource for members in the Rocky Mountain region, providing opportunities for professional development through, networking, mentoring, and public service.